A Braves blog of statistics, numbers, and CPA-driven analysis about Atlanta and the rest of the NL East. 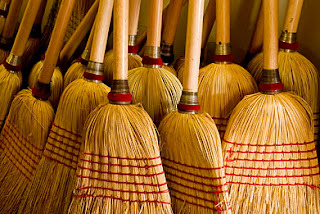 Is that the brooms? After a Nationals series? You bet! The Braves managed to pull off a weekend set of stunners against a Nationals team that looked very confused at the plate. The Braves doubled the Nats run totals in the series, and the pitching was all we could ask for and more. Was it perfect at the plate for the Braves? Absolutely not, but when the chips were down we still found ways to win. When you're in a playoff race, that's what counts, especially at home. Game 1 was the toughest of the bunch, but we had our toughest pitcher on the mound. Kris Medlen and the Braves = wins, period. He's risen to the point of uncanny with his peformances on the hill. Medlen goes 7 innings giving up 1 run on a career high 13 strikeouts. He had the Nats completely off balance for the majority of the game. Meanwhile, the Braves lineup was equally as confounded by Ross Detwiler. It wasn't until the bottom of the 9th, with unlikely hero Tyler Pastornicky at the plate, that the Braves finally pushed across on the winning run on a throwing error by the Nats. Good thing too, because Fredi G completely gambled and tossed Kimbrel in a tie game at the top of the 9th to set up the winner. The K Crab gets the win, the Nats get the loss, and Medlen gets the MVP for his stellar work yet again. All on an 0-7 with RISP performance by the Braves lineup. Medlen's now sporting a 1.62 ERA on the season, and has removed all doubts from most fans' minds that he's the go-to guy in the 1 game playoff. Game 2 had Hanson on the mound (aka - The Sad Trombone). Why? Because that's the sound I play in my head when he walks out to the hill. True to form, he immediately gave up 4 runs in the first two innings. He only went 5 innings on 85 pitches. He's completely out of any playoff rotation in my mind, unless something horrible happens. Frankly, I'm sick of him. He's a Boras client, and he fought the 1 year renewal of his contract in 2011. He's arbiration eligible in 2013. I wouldn't pay him dollar one, the way he's pitching this year. He's well over a 4 ERA, his WHIP is 1.45 (insanely high), and he won't even get close to 200 innings with over 30 starts in the regular season. Both Minor and Hudson have pitched more innings, and Huddy missed the first month of the season. Yet, despite Tommy, the Braves bats woke up in time to win this game. How? Freddie Freeman. Special Fred went 3-4, 2 runs, and a bomb that went 423 feet. He got the MVP nod for his amazing work at the plate. Also, Jason Heyward had a homer with 2 RBIs, and Dan Uggla had a double with an RBI. The game turned on the weirdest of plays, when Simmons was plunked with the bases loaded in the 8th. Lucky, because the Braves were only 1-8 with RISP. Game 3 was a win I didn't expect at all. Minor hadn't been getting much run support, Gio Gonzalez was going for the Nats, and I felt that our bad performance with RISP in the first two games would bite us in the third. WRONG! Braves score 5 runs in a 5-1 win, and they do it with 2-9 RISP on no homers. How is that possible? Bad errors and sacrifice plays is how. Braves got 2 of their 5 runs on sacrifices, and only 3 total runs were earned. Dan Uggla gets the MVP for his clutch 2 out 2 RBI hit in the 7th that iced the game. He's been getting better. I can't and won't say he's back, but I'm certainly more optimistic. The numbers certainly bear that out. Dan in his last ten games is batting .314 with 4 doubles, a homer, 4 RBIs, 7 walks, and most importantly only 4 strikeouts. Holy smokes. That's 10x better than the Uggla we saw as a turnstile in August. Maybe there's hope for him in a playoff run. I'm withholding judgement until the end of September, but he gets a thumbs up. Braves head today into a 3 gamer in Miami. Huddy is going against a 2-4 pitcher in Leblanc. Assuming we can get through Huddy's shakey first two innings, I think we'll be okay. However...Mondays. Quick stat: Braves are 7-4 when starting a new road trip. Even more obscure, the Braves are 5-1 this season when starting a road trip after a home win. Even though it's a Monday, I feel pretty good about the matchup. Let's keep the streak rolling all the way to the playoffs! I come home from a long day of cranking the adding machine, and during baseball season I know that almost every night at 7PM, the Braves will be there. They are like a comforting sports night lite. I fully admit to doing the Chop in my own living room, by myself, in order to get a rally going. I also admit to getting entirely too involved in the games by yelling at the TV. My neighbors probably think I'm insane. They may be correct. I'm also a devout Christian, and a friend of Jesus. I enjoy discussing the Bible and teaching a class at my local church.